This recipe is SUPER easy if you leave out all the ingredients marked optional. And they truly are optional. The broth is very good made with only the chicken bones and skin. That's how we usually make it. Put skin and bones into a large pot. If you wish, add onion, carrot, celery, bay leaves, peppercorns. Simmer for 3 to 9 hours. Add more water as needed. Strain the liquid (while it's still warm) and save it to use as broth. After the broth has cooled, store in refrigerator. If you are in a hurry for it to cool down, add some ice cubes. The broth is concentrated and you may want to dilute it with water when you use it anyway. Remove any fat that congeals on the top. Use within a week or so in your favorite soup recipe or roasted vegetable stew or green chile stew or lentil soup or Thai soup or black eyed pea stew or chile. Or if you want to spend more time and make a slightly richer broth ... We learned to make this broth via this good New York Times recipe for turkey gravy. We've made this with turkey legs and found the turkey meat tasted fine even after boiling 6 hours. We used it (along with the broth) to make turkey chile. Put turkey or chicken in roasting pan; salt, pepper, brush with the melted butter. 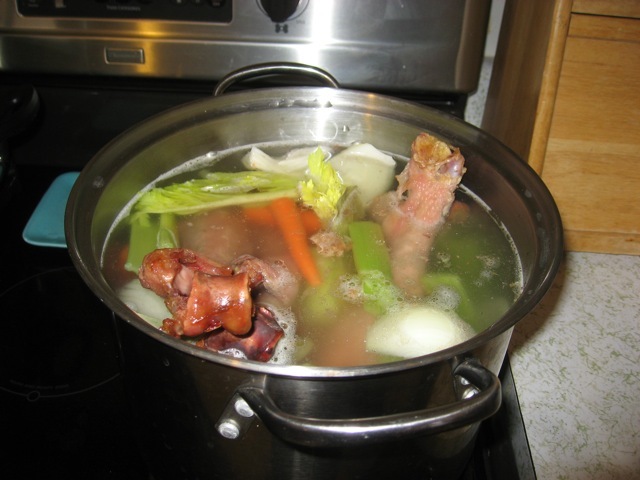 Put the cooked meat, skin, bones and all, into large pot. Add vegetables. Add water to cover everything in the pot. Start it simmering. Simmer the broth for 6 hours. Use as needed in recipes that call for broth. Freeze what you won't use soon.